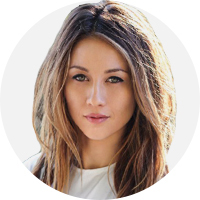 Jessica Kemejuk—actress, spiritual seeker, and new Baha’i—grew up in Los Angeles, where she suffered from bullying and racism because of her mixed-race, half-Japanese and half-Russian ethnicity. In a journey to find someplace where she would be accepted for her whole self, she encountered and tried on many spiritual modalities, until she met a Baha’i. Then, she says, for her the Baha’i writings and prayers “resonated in this place that only truth does.” She witnessed the vibrancy, honesty and clarity of the Baha’i community, and decided to become a follower of Baha’u’llah. Watch and listen as Jessica explains what impelled her to walk that spiritual path. Very nice speach so intetersting!! Jessica, that was a beautiful presentation. Thank you for sharing. I almost cried! Thank you so much for sharing this! Jessica a nice speech from the heart.... Now you are home with The Beloved. May you grow stronger and deep in the Faith. Bless you. What a sweet human being. Divine nectar. May you illuminate the world with as great actress. God bless you.